Our Oxford Mathematics Public Lectures have been a huge success both in Oxford and London, and across the world through our live broadcasts. Speakers such as Roger Penrose, Stephen Hawking and Hannah Fry have shared the pleasures and challenges of their subject while not downplaying its most significant element, namely the maths. But this is maths for the curious. And all of us can be curious. On the back of this success we now want to take the lectures farther afield. 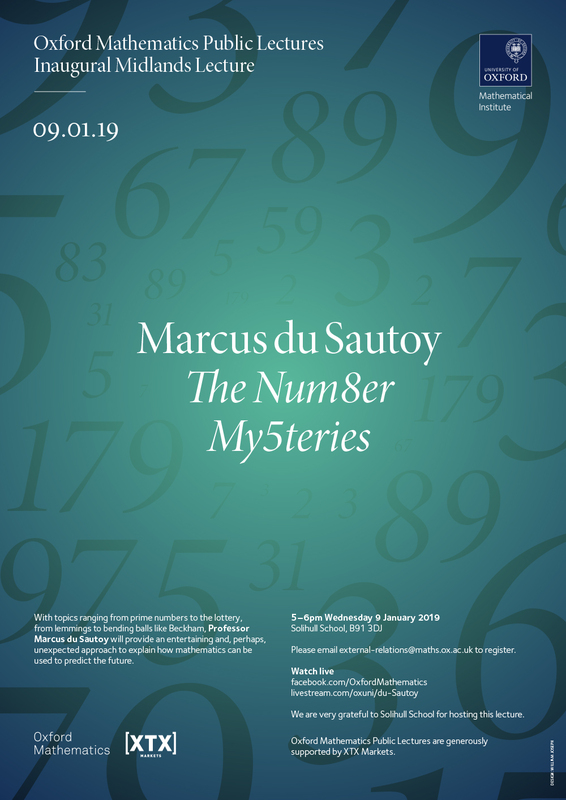 On 9th January our first Oxford Mathematics Midlands Public Lecture will take place at Solihull School. With topics ranging from prime numbers to the lottery, from lemmings to bending balls like Beckham, Professor Marcus du Sautoy will provide an entertaining and, perhaps, unexpected approach to explain how mathematics can be used to predict the future. We are very grateful to Solihull School for hosting this lecture. Please contact us for feedback and comments about this page. Last update on 4 December 2018 - 11:50.